In this book, I argue that we must take a situational perspective in order to understand privacy and self-disclosure processes in mediated and nonmediated environments. I therefore developed the theory of situational privacy and self-disclosure, which 1) synthesizes independently developed theories of privacy and self-disclosure in one comprehensive theoretical rationale, 2) provides an abstract framework that allows for identifying and systematizing antecedents of self-disclosure into personal and environmental factors, and non-situational and situational factors, and 3) restructures privacy-related concepts such as privacy regulation behaviors, privacy perceptions, self-disclosure decision processes, and evaluation processes into a consecutive order that allows for the investigation of them in both mediated and non-mediated communication situations. I tested the theory in the context of smartphone-based communication. Using a combination of survey, tracking, and experience sampling methods, I found that both the level of privacy and the amount of self-disclosure vary across situations). In consequence, situational differences explained a larger part of the self-disclosure variance than interpersonal differences. Within communication situations, particularly internal personal factors and interpersonal factors of the environment predicted the depth of self-disclosure. Non-situational personal factors and external factors of the environment were less powerful. However, additional interaction analyses revealed that for people with higher online privacy literacy, vertical privacy concerns became significant negative predictors of self-disclosure suggesting that a certain knowledge is needed before general concerns are translated into actual behavior. You can buy the hardcover book or the ebook here. Theoretical work on privacy and self-disclosure implies that the level of privacy and the amount of self-disclosure vary across situations. Empirical studies in the context of online communication, however, have mostly taken a more general approach and investigated aggregated behavioral patterns instead. Perhaps due to the complexity of analyzing the effects of situational factors on people’s behavior, many studies have focused on explaining individuals’ privacy-related behavior with dispositional factors (e.g., the relationship between general online privacy concerns and estimations of the average level of self-disclosure on social network sites). Although such research has provided several insights into what drives people’s general behavior, I argue that we have put too much importance on identifying person-specific behavioral patterns and have failed to recognize the power of situationally varying factors in determining people’s behavior. Particularly since the use of smartphones has become widespread and corresponding multimodal communication practices have emerged, a situational perspective is particularly warranted. As interpersonal communication increasingly takes place in a variety of applications, individuals today are confronted with novel and constantly changing environments, which determine the prevailing level of privacy and, in turn, the psychologically perceived adequacy for engaging in self-disclosure. Identifying the environmental factors that may influence these perceptions and decisions situationally hence becomes an important endeavor. Thus, this dissertation proposes the theory of situational privacy and self-disclosure, which aims at solving several gaps in the existing literature: First, it synthesizes independently developed theories of privacy and self-disclosure in one comprehensive theoretical rationale. Second, it provides an abstract framework that allows for identifying and systematizing antecedents of self-disclosure into personal and environmental factors, and non-situational and situational factors. Such a framework makes the entirety of circumstances affecting individuals’ behavior in a situation amendable to theoretical and empirical investigation. Third, it restructures privacy-related concepts such as privacy regulation behaviors, privacy perceptions, self-disclosure decision processes, and evaluation processes into a consecutive order and thus provides a comprehensive model of privacy and self-disclosure processes that allows for the investigation of them in both mediated and non-mediated communication situations. A second aim is the empirical investigation of the theory in the context of smartphone-based communication. The goal is to predict people’s privacy regulation behavior (i.e., choosing certain applications and manipulate them to suit their individual privacy needs) and their situational depth of self-disclosure based on the interaction of the person and the environment. The dissertation is divided into three parts. Part I represents the development of the theory of situational privacy and self-disclosure based on an in-depth analysis of the existing theoretical and empirical literature on privacy and self-disclosure. It starts with an analysis of new media environments and they ways in which they have caused new threats for individuals’ privacy (chapter 2). In particular, I identify several horizontal and vertical dynamics that may impede or violate people’s privacy when communicating in networked environments. On the horizontal level, these include the heightened risks of information dissemination to unwanted audiences and the convergence of formerly distinct social spheres. On the vertical level, these refer to the increasing commodification of information and its evocation of constant data collection and surveillance practices. In light of this discussion, I investigate whether the predominant theories of privacy and self-disclosure (which scholars developed mostly before the proliferation of personal computing and in particular before the emergence of social media) hold up to the dynamics of constantly changing media environments. Hence, I subsequently discuss predominant theories of privacy (chapter 3), self-disclosure (chapter 4) and those who aimed at combining both in comprehensive models (chapter 5). A preliminary conclusion reveals that these theories indeed provide a useful framework for generally conceptualizing and investigating privacy, privacy regulation behaviors, and related self-disclosure processes. In particular, I assert that they offer a useful conceptualization of privacy as a form of limited access and emphasize that privacy is not an end itself, but serves to satisfy these fundamental needs, or to implement behaviors that serve to satisfy these needs (e.g., self-disclosure). They thereby propose a functional relationship between privacy and self-disclosure, and additionally a way to classify privacy regulation into preventive and corrective measures that are directed at achieving a certain level of privacy (i.e., limited access). In a next step, I nonetheless review the recent literature on online privacy and self-disclosure in order to identify potentially necessary modifications or extensions (chapter 6). The analysis shows that the discussed theoretical approaches lack a differentiation between horizontal privacy (i.e., from other people) and vertical privacy (i.e., from service providers and institutions), neglect the collaborative or networked nature of online privacy and the corresponding role of interpersonal trust, and do not explicitly acknowledge the multimodality of privacy regulation behaviors that is characteristic for online communication in general, and smartphone-based communication in particular. Based on these conclusions, I propose the theory of situational privacy and self-disclosure (chapter 7). It rests upon five basic suppositions derived from the previous chapters. (1) The level of privacy is determined by the perception of the environment and is thus situational. (2) A certain level of privacy is needed to satisfy more fundamental needs or to perform behaviors (e.g., self-disclosure) necessary to satisfy these needs. (3) The level of self-disclosure is determined by personal factors and the perceived level of privacy. (4) People seek certain levels of privacy (e.g., to be able to self-disclose) by choosing and manipulating environments. (5) People evaluate the effectiveness of their privacy regulation, the accuracy of their environmental assessments, and the outcomes of their self-disclosure. Thereupon, the theory distinguishes between three components: First, pre-situational privacy regulation processes explain how people actively choose certain environments they deem appropriate for communicating private information and how they further manipulate these environments by use of the available features or artifacts (e.g., privacy settings in diverse social media). Second, situational privacy perception and self-disclosure processes describe how the prevailing environmental circumstances determine the situational level of privacy and how this affects individuals’ depth of self-disclosure. Specifically, it is assumed that people perceive a high level of privacy when the number of recipients is small, when they are deemed trustworthy and psychologically close (interpersonal factors), and when the prevailing physical or virtual artifacts prevent identification or content accessibility to an appropriate degree (external factors). Under such circumstances – and additionally depending on their personal characteristics (non-situational personal factors such as personality, trait concerns, skills…) and their situational cognitive and affective processes (internal personal factors such as motives, feelings…) – people will engage in self-disclosure. Third, post-situational evaluation processes describe how people evaluate the effectiveness of their preventive privacy regulation, the accuracy of their environmental assessment, and the outcome of their self-disclosures. These evaluations – and in some cases privacy violation experiences – shape their future privacy regulation and situational assessments. The second part represents the empirical investigation of the theory in the context of smartphone-based communication. The aim of the study is to answer two main research questions: (1) Which personal factors influence people’s decision to choose certain applications over others and to what extent do these factors explain the use of privacy strategies and settings within these environments? (2) Which personal and environmental factors influence the situational depth of self-disclosure? In a first step, I define smartphone-based communication and identify communication environments and their specific external characteristics. Subsequently and in line with the assumptions of the theory, several concrete hypotheses are derived (chapter 8). The challenge of measuring individuals’ situational behavior alongside all identified situational factors over a longer period of time is overcome with a multi-method research design: Traditional survey methods are combined with a specific experience sampling method (ESM) which allows to trigger situational questionnaires right after actual communication situations (chapter 9). In sum, N = 1.572 respondents took part in an online pre-survey and a subset of n = 164 participants also completed the two-week ESM study. In this second part of the study, people were asked to install a specifically programmed application (movisensXS) on their own smartphones that allowed for saving people’s smartphone and application use in log files, which, in turn, were used to trigger situational questionnaires right after pre-defined communication applications (instant messengers, social network sites, microblogging services, and e-mail services) were used. 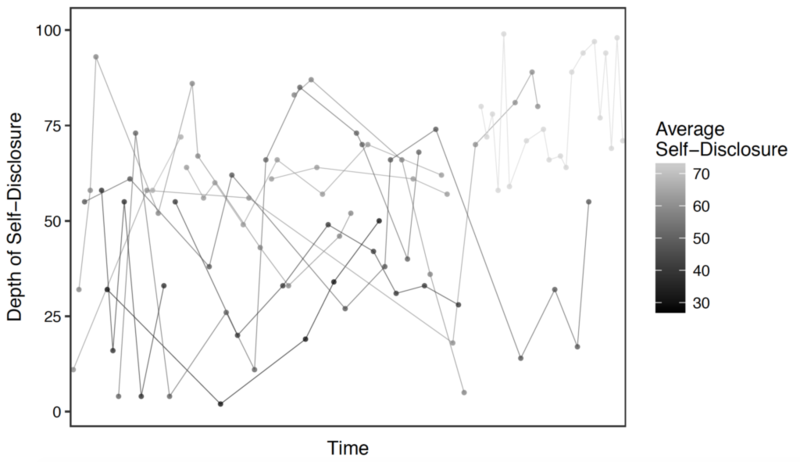 This type of ESM sampling is also known as automatic event-contingent sampling, and provides reliable and externally valid measures of situational perceptions or behaviors. In the end, the participants produced 1,104 situational disclosure events (on average M = 6.78 per person, SD = 5.34). The analyses showed that vertical privacy concerns and online privacy literacy are important predictors of preventive privacy regulation behaviors. More concerned and more literate participants indeed chose more privacy-friendly smartphone applications and further regulated the level of privacy by implementing application-specific privacy settings. Furthermore, the results confirmed the main assumption of the proposed theory (that both the level of privacy and the amount of self-disclosure vary across situations). In consequence, situational differences explained a larger part of the self-disclosure variance than interpersonal differences. Within communication situations, particularly internal personal factors and interpersonal factors of the environment predicted the depth of self-disclosure. Non-situational personal factors and external factors of the environment were less powerful. 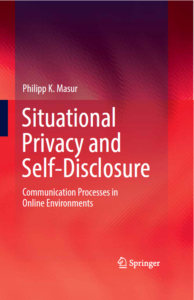 However, additional interaction analyses revealed that for people with higher online privacy literacy, vertical privacy concerns became significant negative predictors of self-disclosure suggesting that a certain knowledge is needed before general concerns are translated into actual behavior (chapter 10). The discussion of the results shows that they align with many assumptions of the proposed theory (chapter 11). That said, due to the explorative nature of the study, several limitations must be taken into account. Particularly power and variance constraints reduce the study’s ability to detect effects of non-situation personal factors and the external environmental factors. In sum, however, the study showed that the proposed situational approach provides valuable and more fine-grained insights into privacy and self-disclosure processes. In this part, I offer an overall discussion of the proposed theory in light of the empirical results. I argue that the theory provides a valuable framework that nonetheless can and needs to be adapted and modified to future developments and findings (chapter 12). Furthermore, I argue that it can be criticized for its underlying paradigms: First, the theory assumes that individuals are rational agents in their decision to regulate their privacy and to self-disclose. However, as shown by recent work and the results of the conducted study, people oftentimes seem to be bounded in their rationality. I thus discuss the possibility to integrate the concept of heuristics as a way to account for such irrational processes. Second, the theory assumes that the subjective representation of the reality shapes people’s behavior. Such a constructivist view may neglect that that physical cues itself may shape human behavior too. Recently, scholars introduced the concept of affordances, which represents a promising approach to overcome the subject-object or agency-structure dichotomies that are prevalent in much current research on online communication. I hence discuss the merits of an affordance perspective for the proposed theory. Finally, I offer some perspectives on future research and some practical implications of this work (chapter 13). Most important, I argue that there needs to be a stronger focus on research investigating disclosure of personal information and meta-data, and not only self-disclosure. Furthermore, an in-depth theoretical analysis whether existing theories of privacy also allow for capturing privacy losses beyond individual control (i.e. a loss of privacy due to other’s disclosure behavior), and a more thorough investigation of the role of online privacy literacy is warranted. In light of the theoretical rationale provided in Part I, and the findings described in Part II, I finally advocate for more nuanced research investigating the role of online privacy literacy in fostering individual self-determination and political deliberation in the context of online media use.